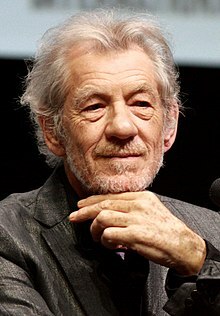 Sir Ian Murray McKellen, CH CBE (born 25 Mey 1939) is an Inglis actor. ↑ "Monitor". Entertainment Weekly (1208). Time Inc. 25 May 2012. p. 21. ↑ Jackson, George (4 February 2013). "Nesbitt does the honours as fellow actor McKellen gets Ulster degree". Irish Independent. Independent News & Media. Retrieved 4 February 2013. McKellen is recognised as one of the greatest living actors.